Unless your time spent outdoors is confined to just the daytime, a sleeping bag that meets your expectations and needs is essential. Whether you plan to camp in the summer or winter, high up in the mountains or down by a lake, with a car packed full or with just the bag on your back there are plenty of sleeping bags suited to the occasion. So before you rush off to the nearest camping supplies store, stop to consider your needs – this will give you a more likely chance of finding the best sleeping bag for you. There are three types of sleeping bag shapes: rectangular, barrel and mummy styles depending on you and your outdoor sleeping needs. Be aware of the climate and temperatures you will be sleeping in to ensure your sleeping bag’s temperature rating will be sufficient. Otherwise you may be in for a very cold or warm nights sleep -which will not help prepare you for a day packed full of adventure. When buying a sleeping bag you need to be aware of these key features: sleeping bag weight, size, durability and comfort. Whether you are looking for a heavy duty sleeping bag or one that is lightweight, it is important you get it right. If you scrimp on your sleeping bag you will soon regret not getting one of quality that is suitable for you. 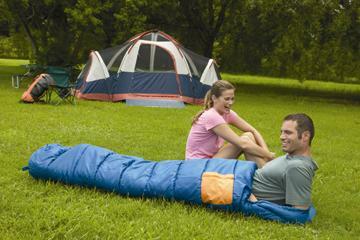 There is a lot to consider before choosing and purchasing a sleeping bag for your upcoming camping trip. Keep these factors in mind to help you make the best choice.